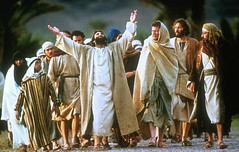 Matthew was one of the 12 apostles chosen by Jesus Christ. (Matthew 9:9; 10:3) He was a collector of taxes. As such, he was skilled in taking notes and making reports. He also was despised by the Israelites. Tax collectors (sometimes referred to as publicans) were the car-salesmen of their day. They were required to pay a certain amount to Rome, but they were authorized to charge higher prices in order to recompense them for their work. A tax collector could collect as much over the rate as he could. There was no set fee. They were hated by all. Such was Matthew when Christ called him as a disciple. Many have argued over whether Matthew actually wrote Matthew or whether someone else did, whether Matthew was the first, second, or third gospel written, whether Matthew was written originally in Hebrew, Aramaic, or Greek. Papias (60-130 A.D.) stated that Matthew recorded his history in the Hebrew dialect. Ireneus (175-195) states that Matthew was published by Matthew in Hebrew while Peter and Paul were preaching in Rome. Origen (185-254) stated that Matthew was the first gospel written, it was written by Matthew, and it was published in the Hebrew tongue. Thus, the church fathers appear unanimous in the view that Matthew wrote Matthew. Further, it appears, if it was written while Peter and Paul were at Rome, to have been written in the early 60’s. It was written in the land of Israel, probably Jerusalem. If it was the first gospel written, the others could not have been long thereafter. Afterwards, tradition tells us that Matthew went to Ethiopia and perhaps to some other countries. Eusebius tells us that Matthew wrote Matthew when he was on the point of going also to the other nations. According to some traditions, Matthew died a martyr in Ethiopia. According to Heracleon (about 150 A.D.) and Clemens Alexander, Matthew did not suffer martyrdom. Whether written in Hebrew or not, the book has a strong Jewish flavor. There are some 61 quotations from the Old Testament in this book and many more allusions. In contrast, Mark has 31, Luke has 26, and John has 16. Of all of the New Testament books, only Romans has more Old Testament quotations (64). The book is the culmination of the Old Testament and of all of Scripture. In this book is the record of Jesus Christ fulfilling the prophecies of the Old Testament. It is the only gospel to mention the church. It is the gospel that gives us the message of the kingdom. It is the gospel that gives us the Great Commission. From this gospel we can look backwards and forwards, surveying the landscape of Christological history. The book contains three great discourses, or lessons. The first is what we know of as the Sermon on the Mount and is found in Matthew 5-7. The second is what we know as the Parables of the Kingdom and is found in Matthew 13. The third is the Olivet Discourse and is found in Matthew 24-25. The first is the finest sermon ever recorded on Christian living, the second gives us great insight on the nature of the kingdom, and the third prepares us for the return of Christ. Many have long recognized that Matthew actually contains 5 discourses. Each discourse ends with the words “It came to pass that when Jesus had finished these words” or something very similar. (7:28; 11:1; 13:53; 19:1; 26:1) Together with a beginning detailing the birth of Christ and an ending detailing his death and resurrection, these 5 discourses form a 7-fold division in the book.